PT Bank BNI Syariah – BNI Syariah is a reputable sharia banking company in Indonesia with fast business expansion. BNI Syariah offers a full-range of general banking services based on Islamic principles with financing business segments on commercial business, consumer and retail business, micro business, treasury and international business. PT Bank BNI Syariah is a sharia banking subsidiary company of PT Bank Negara Indonesia (Persero) Tbk (BNI Group). As today, BNI Group – the third largest state-owned banks in Indonesia – controls 99.99% shares in BNI Syariah. Other 0.1% remaining shares in BNI Shariah was owned by PT BNI Life Insurance, a reputable insurance company in Indonesia which majority owned by BNI Group. 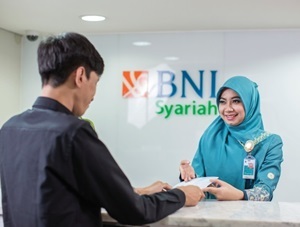 Domiciled in Jakarta, BNI Shariah offers services through 67 branch offices, 165 sub branch offices, 17 cash offices, 8 functional offices, 22 mobile services vehicles, 20 payment points, 202 ATM BNISyariah units, and 1500 outlets spread in all over Indonesia (As of December 2017). BNI Syariah’s head office is registered at Gedung Tempo Pavilion 1 Jl HR Rasuna Said Kav 10-11, Lt 3-6. Jakarta 12950.